In LA during the hooplah lala over the film The Interview, so of course, it made sense to try and catch a screening to boost sales and the American Way of self-expression. 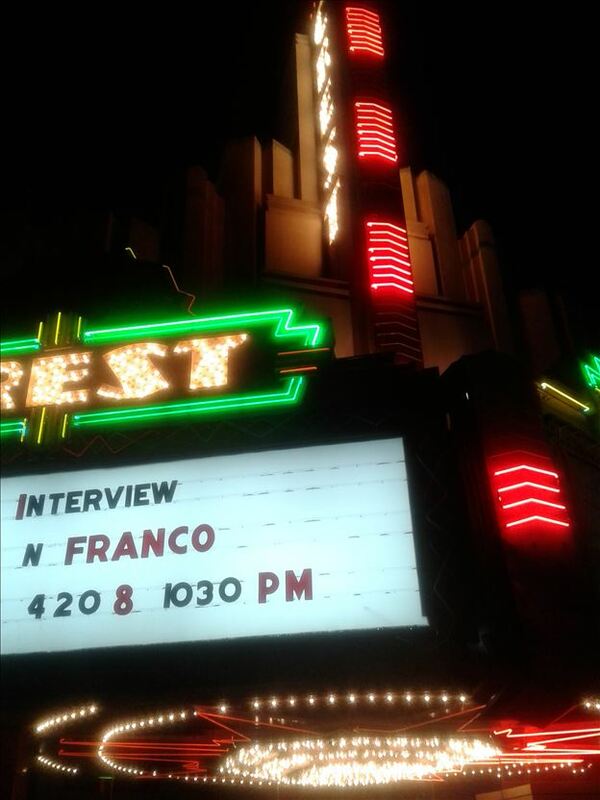 Not a particularly huge fan of the previews I had seen, but when I read that there was a 10:30 show at The Crest Theatre in Westwood, I made a beeline. The Crest has been restored and seems to be run by a sister/brother team of Weezie and DJ.With deep New Orleans roots, DJ is so hospitable, that when my Uber ride dropped me off almost forty minutes early, he let me come in and salivate over the Art Deco inner world. As my father had a theatre, I’m a huge fan of the one -screen houses and The Crest is certainly that, even keeping its projecter to show real film instead of only digital like most theatres these days. The etched glass, the sunburst reliefs, the navy blue ceiling with tiny stars —it all makes for a completely romantic environment. When DJ suggested i take a sofa seat, I curled up on one of the six or so sofas with my $2.50 bag of real popcorn, ready to face whatever indignities Seth Rogan could throw my way. I didn’t find anything particularly funny despite being a Rogan fan. I like crude. Just last nite I saw National Lampoon’s Dirty Movie and shamedly found myself howling. But Interview’s script didn’t hit any of my bones. I didn’t laugh until Rogan makes a comment about second hand smoke on a train in China. HIs willingness to be hypocritical and weak give him an odd strength which is fun to watch. The political and media hype for the film release might have been the real star of The Interview if actor Randall Park as Kim Jong Un hadn’t been so good. His fem/masculine portrayal is fun and brave, especially with the real Un still alive and probably fuming. Park plays it full out, balancing sweet and diabolical in quite arresting ways. Sorry I couldn’t say the same for Franco whose dancing mouth, much like Timothy Spall’s pig snorting in Turner, needed to take a rest. But then there’s The Crest. With its wonderful marquee and magic vibes of yesteryear, I felt privilieged to be a guest.